When Intel first introduced its high-end Skylake-S CPUs with unlocked multiplier about half a year ago, it was not easy to get them and for a long time the Core i7-6700K as well as the Core i5-6600K were overpriced and in tight supply. Their retail prices dropped and their availability generally improved earlier this year, but the Core i7-6700K was still rather expensive in some stores. Today, both unlocked Skylake-S chips are available and their prices no longer significantly exceed MSRPs. Nonetheless, despite the equal MSRP to the high-end desktop in the Core i7-5820K, the i7-6700K is still more expensive as the price continues to drop. Intel’s most powerful desktop quad-core processor for mainstream enthusiasts which is positioned below the HEDT platforms, the Core i7-6700K (four cores with Hyper-Threading, 4.0 GHz/4.20 GHz, 8 MB cache, Intel HD Graphics 530 core, unlocked multiplier), has an official MSRP of $350 according to Intel’s ARK. However, for a long time it was impossible to find at that price point: it used to cost $420 in December and up to $412 in February. Moreover, even overpriced, it was still hard to find at the biggest retailers. The availability of the Core i7-6700K (BX80662I76700K) improved this month. All major outlets monitored by NowInStock, including Amazon, B&H Photo, NCIXUS and Newegg had the chip in stock for $364 – $408. BestBuy lists the CPU for $409.99, can ship it in two days, but does not provide any store pickup options, which indicates that it does not have the product everywhere in its locations. Back in December, only Newegg had the Core i7-6700K in stock, so, it is evident that the U.S. retailers are getting more units through distribution. Newegg offers the Core i7-6700K for $369.99 and the CPU was in stock at press time. The chip used to cost $412 last month at Newegg, so, it is evident that the retailer significantly decreased its price in the recent weeks. According to PriceZombie, which monitors Newegg, it slashed the price of the i7-6700K to around $380 early in March, reduced it to $365 earlier this week, but then hiked the price to $369.99. It is evident that the Core i7-6700K is still sold at a premium, its prices at different locations are higher than Intel’s MSRP for the chip. Nonetheless, it is clear that a significant progress has been made and now the CPU is both widely available and no longer costs $50+ more than it should. The Intel Core i5-6600K (four cores, 3.50 GHz/3.90 GHz, 6 MB cache, Intel HD Graphics 530, unlocked multiplier) is the other overclockable Skylake processor, and is popular among overclockers and enthusiasts due to its modern micro-architecture and performance in most consumer situations compared to the i7 variant. The processor is officially priced at $243, but it used to cost $290 in December. 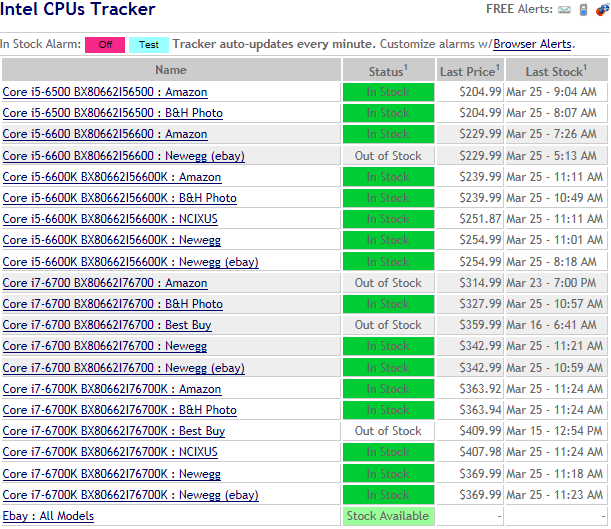 Moreover, only Newegg had the CPU in stock back then. 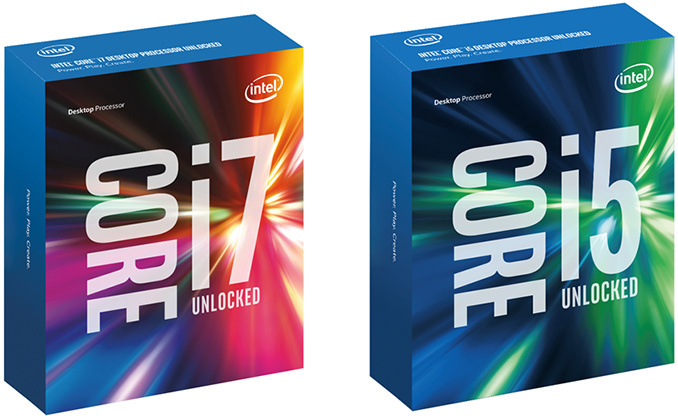 By contrast, Intel Core i5-6600K (BX80662I56600K) is currently available from all major U.S. retailers for $239.99 - $254.99 right now, based on information from NowInStock web-site. Amazon has Intel Core i5-6600K processors in stock and offers them for $239.99, down from $249.99 several weeks ago. According to CamelCamelCamel, the retailer slashed the price of the product to a level below Intel’s MSRP only this week. As for Newegg, it sells the Core i5-6600K for $254.99, which is higher than Intel’s official price and slightly up from February. However, if you enter the EMCEHGT62 promo code (expires on 3/30) and subscribe to Newegg’s newsletter, you can get a $15 discount and obtain the chip for $239.99. Based on data from PriceZombie, the price of the i5-6600K at Newegg has been fluctuating from $250 to $255 for several weeks now. The exact reason why the Core i5-6600K CPU dives below its MSRP is unknown, but the broad availability of the chip intensifies competition between various retailers and they are willing to offer lower pricing in a bid to sell. The Intel Core i7-6700K processor based on the Skylake micro-architecture has a number of advantages over previous-generation chips, but the entry-level high-end desktop processor, the Core i7-5820K CPU (six cores with Hyper-Threading, 3.30GHz/3.60 GHz, 15 MB cache, unlocked multiplier), still remains a very interesting product from many points of view. Moreover, it is still cheaper than the quad-core Core i7-6700K despite having more cores. The baby HEDT chip is now available for $349.99 from Amazon and Newegg, which is well below its official price of $396. 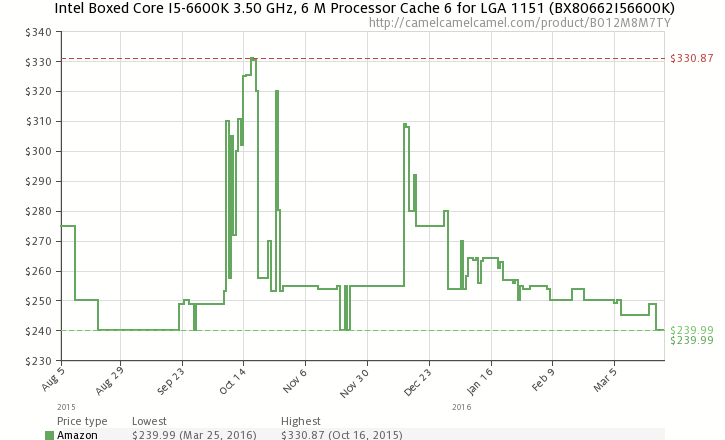 The Core i7-5820K used to cost over $380 in February, so, it is evident that its price dropped substantially within several weeks. Keeping in mind that Intel is expected to update its high-end desktop family of processors with Broadwell-E offerings later this year, it is not really surprising that Haswell-E products are getting more affordable. Of course, to use the Core i7-5820K (BX80648I75820K) you will need an X99-based motherboard (on average, costs more than Skylake focused 100-series motherboards), an advanced cooler, and four DDR4 memory modules to maximize the available memory bandwidth. However, for $349 you get six Hyper-Threaded cores that can be easily overclocked and a capable motherboard (most new X99 have USB-C 3.1, but M.2 and Thunderbolt 3 options are varied). Moreover, the Intel X99 platforms will eventually support Broadwell-E processors later this year. Intel’s 14 nm Supply Finally Meets Demand? Intel has confirmed multiple times in the recent quarters that demand for its Core i7 high-end CPUs as well as K-series chips with unlocked multiplier were at a record high. The unprecedented demand, as well as initially slow ramp of Skylake-S processors, had created shortages of unlocked Core i5/Core i7 chips leading to the high prices of such CPUs in late 2015. Starting from late Q3 2015, Intel has been gradually increasing production of its CPUs using 14 nm process technology. The company began to produce 14 nm processors in its Fab 24 manufacturing facility in Leixlip, Ireland in Q3 FY2015, in addition to its D1D, D1C and D1X fabs in Hillsboro, Oregon. Yields of the CPUs most likely have improved since their introduction in August as well as turning more wafers into desktop parts, leading to larger shipments of higher-end Skylake-S products. 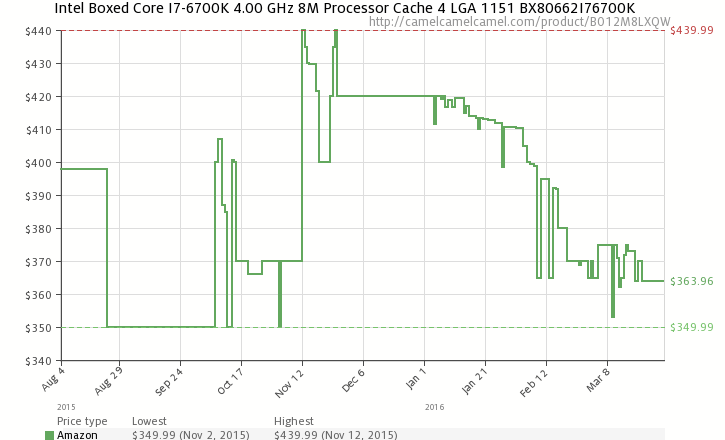 As a result, prices of the Core i5-6600K and the Core i7-6700K are decreasing. 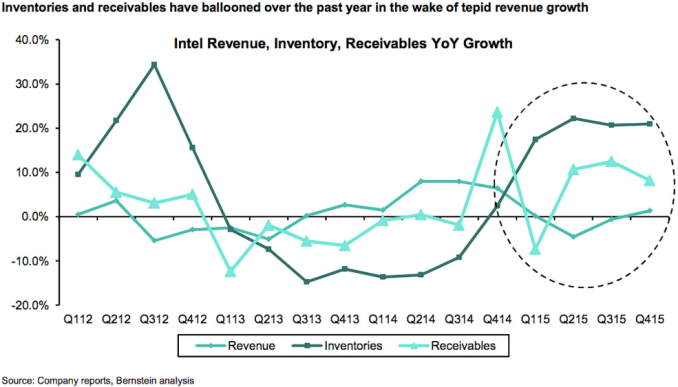 Nonetheless, there could be another reason why the prices of Intel’s CPUs are getting lower. Demand for PCs in the first quarter is traditionally below the demand in the fourth quarter. However, this year sales of PC components in Q1 have been slower than expected, according to market analysts. As a consequence, Intel (as well as Intel's distribution network) have more processors than they can sell, according to Stacy Rasgon, an analyst with Bernstein Research, citing Intel's reports. Moreover, last week analysts John Donovan, Paul Peterson, and Steve Mullane with BlueFin Research Partners reported that based on their checks Intel had cut production of certain CPUs in February and March compared to January. Since no details are known, it is possible that Intel was ceasing production of older products because of demand. 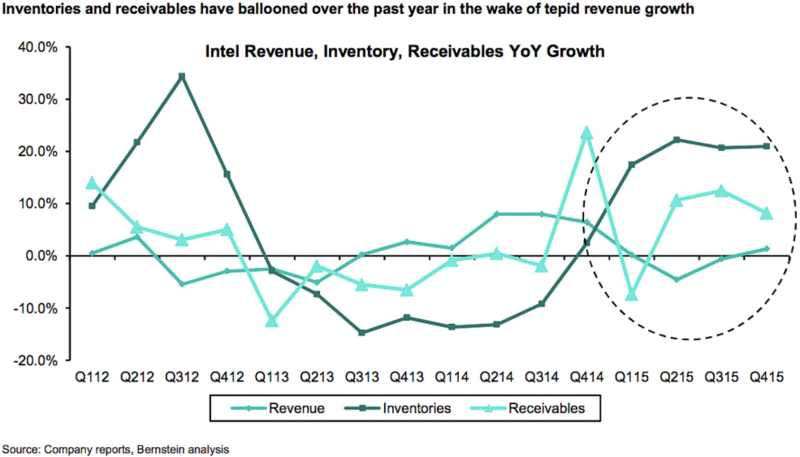 However, since Intel’s inventories and receivables are at high levels, the company may simply not need to produce a lot of processors because the market needs to consume already produced material. Given the fact that the Core i5-6600K and the Core i7-6700K are Intel’s high-end 'mainstream' desktop processors today and their relatively high prices, it is unlikely that their shipments substantially exceed demand. $363.95 base + $0 tax + $0 shipping = $363.95, until it's at your doorstep. $339.99 base + (8.25% tax in my area) $28.05 tax + $??? gas = $368.04 + gas, until it's at your doorstep.